Should Jewishness of Jesus Be Ignored by Gentile Christians Today? I would like to say several things before I get into the topic I want to discuss, just so that there is no misunderstanding (though some may still misunderstand what I’m saying). I am one who fully believes that there is no salvation apart from Jesus. His life, His death, and His resurrection has done the work that no one or nothing else could do. Because of Him, salvation is available to all who call upon His Name in faith. I’m also one of those “oddballs” that believes that once a person is authentically saved, they cannot lose their salvation. I realize people disagree with me so we can leave it at that. I also believe that if the Hebrew Bible (the Old Testament) did not exist and people today only had access to the New Testament, people could absolutely become saved. Further, I believe that even if only the Gospel of John was available today, people could become saved. Beyond this, I do not believe that works has any part in our salvation. The only part works plays is in how we are rewarded after this life, but any rewards play no part in our salvation. It is a gift that God freely gives to those who call on His Name in faith. Lastly (with respect to this article), I fully believe that anyone who is to be saved must receive Jesus as Savior and Lord. There is no special “dispensation” for Jews and another for Gentiles, at least as far as salvation is concerned. Salvation is always based on faith in the One who makes salvation possible, Jesus. It doesn’t matter if you are Jewish or a Gentile. There is no other Name under heaven by which men are saved, (Acts 4:12). That statement (and others by Jesus Himself, e.g. “I am the Way, the Truth, and the Life; no man comes to the Father except through me the Son,” John 14:6, etc. ), point out that there is only one way of salvation and works has nothing to do with it. Jesus did all the work (“It is finished!” John 19:30). The only thing we are to do is believe in His substitutionary atonement for us. Once a person becomes saved (born again or born from above; John 3), then works are to be accomplished. These works, properly done, are done in His strength, through His Spirit, and for His glory. But none of these works are required in order to receive salvation, nor are they required to maintain or keep it. Having said all of this, over the past few days, I’ve come to realize that there is a push-back by many for what is known as the “Hebraic Roots Movement.” From what I’ve discovered, it’s not so much a solidified movement, but a heading under which a very loose-knit group of people exist. As with any “movement,” there is the opportunity for extremism. The Hebraic Roots movement is one that is alleged to go back to the Old Testament, specifically the Mosaic Law to apply it to salvation today for Gentile Christians. They are accused of believing and teaching that Christians must obey the Law, they must adopt the ceremonial regulations (including the dietary rules) of that Law, and even going so far as to say that the original Festivals and/or Feasts originally given to the nation of Israel have to be followed. Before I comment on that, let me say that much of this stems from the belief that not only the Old Testament, but the New Testament (most of it) was written originally in Hebrew, not Koine Greek. Critics, historians, and theologians alike are found on both sides of the issue. Was the New Testament written in Hebrew or Greek and does it matter? Let me answer the last question first. If the New Testament was originally written in Hebrew, then translated to Greek, then to English, yes, there is a problem because our English versions then are not translated directly from the original. But, it is in proving that the New Testament was written in Hebrew originally is where the problem exists. There are numerous websites that argue for each side. How can we know for sure? The only way I know of is by doing your own research. Ultimately, I think it is important to understand the people who wrote the New Testament were Jewish individuals. As such, they spoke Hebrew. They also spoke other languages like Koine Greek, Aramaic, and possibly even Latin. Is it wrong then for Christians to want to learn more about Judaism? No. Is it wrong for Christians to want to research the Feasts, the Festivals, or other aspects of Jewish life? Absolutely not. I firmly believe that the more we know about Judaism (including the nuances of the Hebrew language), the greater our understanding will be of the Old Testament as well as the life of Jesus and the times he lived in. Just because Koine Greek was generally spoken by most people in the Roman Empire at the time of Jesus, that does not mean that when Jesus went to the Temple, He spoke Greek or that the culture in which He lived (Jewish) was all about emulating the Greeks! I think Christians can gain a great deal from studying the languages and the culture of Jesus. We can benefit greatly by learning as much as we can about the Tabernacle, the Temple, the Jewish Feasts, and other cultural aspects of Judaism. To ignore those things is to lose a sense of the Bible’s message and to see how Jesus fulfilled them. I wrote an article recently on the fact that Christians today refer to Resurrection Sunday (aka First Fruits) as Easter. It would be interesting to know exactly how many Christians truly understand that when Jesus rose from the dead, He was fulfilling the First Fruits. 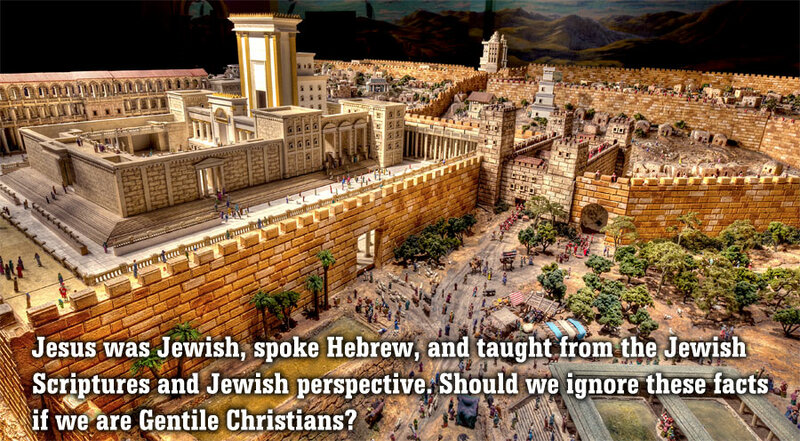 If someone starts telling you that in order to be a better Christian, you must begin adding Mosaic Laws, Feasts, and Festivals to your life or you must learn Hebrew or immerse yourself in Jewish culture, they are 100% wrong! However, if you decide to learn Hebrew, more about the Menorah, the Tabernacle, the Jewish Feasts, or something else related to Judaism because you are interested and you want to know these things because Jesus Himself was immersed in them, there is nothing wrong with that! I’m not so sure there is an official “Hebraic Roots Movement.” I’ve read several statements of faith from these groups (who are not connected), I’ve read books by some of those whom many would argue are leaders within that movement, and with few exceptions, they seem to me to be people who want more of the Lord. Because of that, they extend themselves into studying about the things that Jesus did so they can also see His fulfillment of them. I truly think too many Christians today are not serious enough about Jesus. We say we love Him. We say we are devoted to Him and His ways, but are we? We seem to sit back on our laurels and count on the fact that we are saved and seem not to go further. That would be like marrying someone and never really taking the time to get to know them. You just live together and do things together, but nothing beyond that. You don’t do things that will help you get to know the person. After awhile, don’t you think that relationship will stagnate and even sour? If we – as Christians – say we are in a living, vibrant relationship with Jesus, then what are we doing to prove that? If knowing more about Hebrew, the Jewish Festivals and Feasts, as well as the culture of Judaism will help me get to know Jesus better, then shouldn’t I do those things? The trouble is that Christians who do that are often placed in the same group as those extremists within the “Hebraic Roots Movement” who come to believe that it is only by adding the Jewish aspects of Judaism to our Christianity that we guarantee our salvation. They are the extremists and they are wrong. But for those Christians who want to learn more about the things that Jesus did and participated in simply because it helps us know Him better, there is nothing wrong with that and they should not be characterized like the extremists within the Hebraic Root Movement. I firmly believe that the more we understand Scripture from the Jewish perspective, the greater we will understand His Word. After all, Jesus was Jewish and a Rabbi. Entry filed under: israel, Judaism, Religious - Christian - Theology, salvation. Tags: hebraic roots movement. I must agree with both Sherry and Fred. My grand mother was a very deep spiritual saint. She did however have the old standard painting of Jesus kneeling by a rock praying. Ya’ll know the one. She also had those little wood plaques all over her house with scripture on them. I myself have no religious pictures or statues and I know that the Jewish people where very set against any likeness of a man or creature or graven image in their dwellings. As for Jesus being a Rabbi, there is some writings that point to that and Jesus may have been pruned somewhat as a teacher being the first born and of the line of David. Also he may have been working with Joseph’s family as a “Stone Carpenter”. He may have even worked on the temple and what is He doing today In the spirit? As for the folks that still hang onto the Law I know of a group in Canada that is very deep but still wants us to keep the Saturday Sabbath and many points in the law of Moses. Paul warned all the time of that direction away from the Lord! As for Gnosticism Sherry, the roman catholic church has absorbed much because of Augustine who was born into that cult of the east. Even Mohamed was well read in the works of the Gnostics. I fully agree with your post, modres. But, does there need to be a movement made for studying and learning about the Hebrew Roots of our Savior? Yes, if one believes they can only be obedient to God through observing the feasts, etc. Jesus tore down the dividing wall between Jew and Gentile and most in the HRM are intent on putting it back up. IMO, the HRM had a biblically shaky start and that is why many in HRM are trying to distance themselves from it without denying its premise. FTA: The Hebrew Roots movement began emerging as a distinct phenomenon in the mid-1990s (1993–96). In 1997, Dean Cozzens of Open Church Ministries (Colorado Springs, CO) published a prophecy titled “The Hebrew Movement”, which revealed that God had foreordained four major moves for the 20th century, Pentecostalism, Faith-healing, the Charismatic Movement and finally the Hebrew Roots Movement. In this prophecy, the Hebrew Roots Movement is the “final stage of empowerment” before Christ returns. Several Hebrew Roots ministries are now preferring to use the term Awakening instead of the term “movement” which has been used widely since the 1960s to define politicaly oriented movements. As for one’s salvation, I agree with every point you made in as much as one is worshiping the true Jesus. All of the security in the world comes to nothing if you hear Jesus say, I never knew you, you worker of iniquity. Paganized Christianity and Christianized paganism is of another Jesus since paganism is unredeemable. I don’t think any movement needs to exist at all. I also believe Christians should be more informed about the Jewish culture within the Roman-Greco culture that existed at the time. The problem is that for people who study Hebrew language (me; ongoing) and have an interest in the Jewish Feasts and Festivals, as well as other aspects of Hebrew culture, too many are willing to write me off as a “heretic” for wanting to ADD works to salvation. It has nothing to do with it at all. I look at it this way. If when I met my wife, she was really into ballet dance, I most likely would have gone with her to watch her at recitals and would also have become more informed about ballet in general. By doing that, it doesn’t mean I wanted to become a ballerina myself. It simply means that learning about ballet was a way to learn about my wife if that was one of her interests. Of course, with Jesus, I want to learn about the things specific to Jewish culture because many of them point to Jesus anyway since He is the fulfillment of them. Pray that the Lord will direct me in the path He wants me to go with respect to learning Hebrew culture. I don’t want to overdo it but I would like to become very familiar with and knowledgeable about aspects of all the things that pointed to (and find fulfillment in) Jesus. Thanks! Thank you for your sensitivity concerning the image. Yes, I prayed, and will pray, for you in respect to your endeavor to learn more about the Hebrew culture. May God bless you in this and may you freely share what you learn. What little I’ve learned of it has been fascinating and it does help in understanding our Lord’s earthly ministry. I understand the need for prayer because so many have gone overboard with it. Plus, its my same prayer concerning the sharing of christo-paganism, witchcraft and gnosticism in the Church, that I do so with wisdom and truth and love for the brethren. Anti-X Massers tend to be of the cults, like JCs and the HRMs so discernment from the Holy Spirit is heavily depended on when researching the subject.